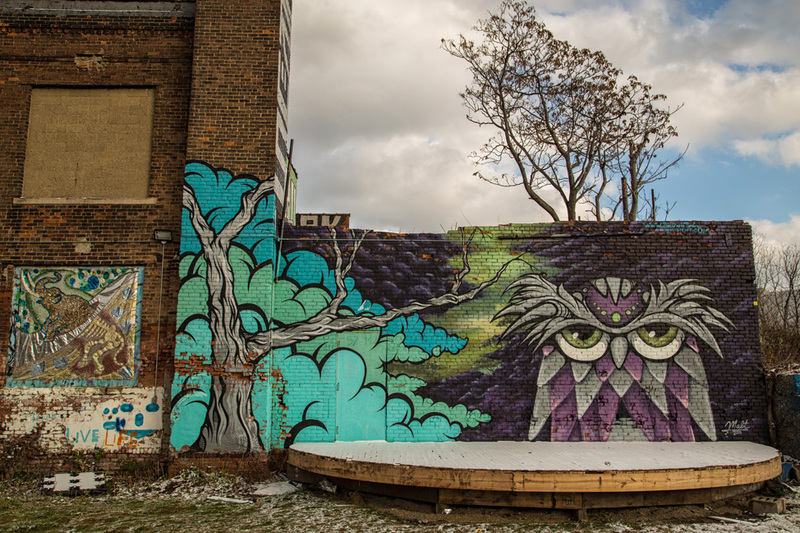 Detroit is not on everyone’s travel to-do list, and we get that. It’s hard to ignore what the city has been through, and bad news is always the toughest to shake. 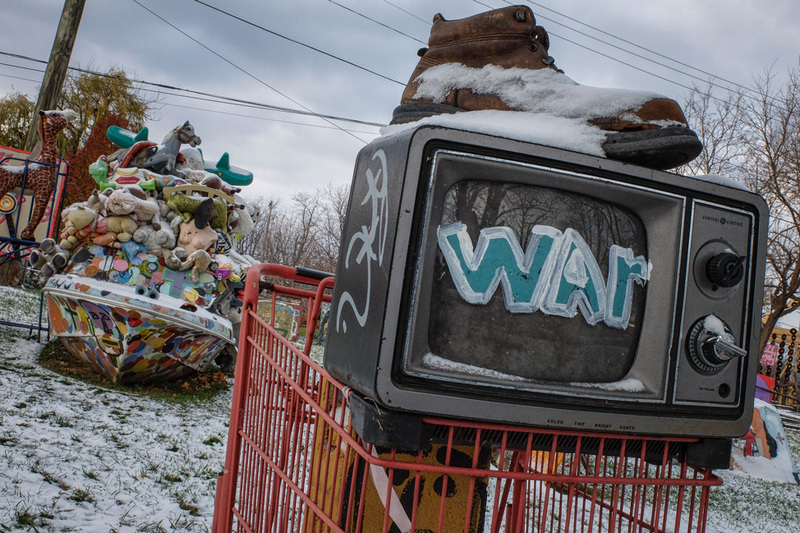 There are scars that still linger from the Motor City’s dramatic collapse. Some neighbourhoods we drove through were completely devastated. There were rows of abandoned houses, some torched black, and lengths of streets without the power to light them. Detroit went from arguably claiming the title of “richest city in the world” to declaring bankruptcy decades later. History proves that power can be patterned – an impressive rise is followed by a peak and fall, then a hopeful bounce back to life. Most don’t realize yet where Detroit currently plots on that cycle. A few days before our visit, a judge approved their plan to exit bankruptcy, an important step in healing the broken city. The crime rates in the downtown are lower than the average for the country. 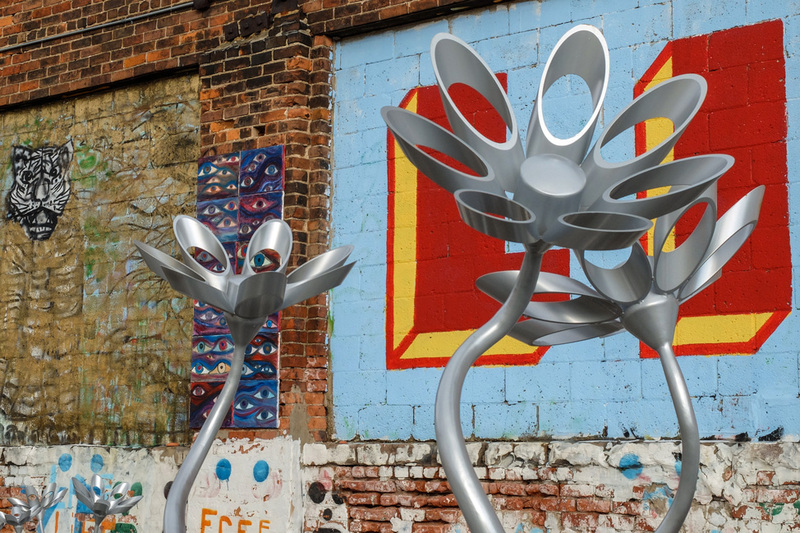 New businesses are popping up regularly, and the self-proclaimed “Detroit Do-er” spirit is alive and well in all the locals we spoke to. Without question, Michigan’s largest city has begun its upswing. History proves that power can be patterned – a dramatic rise is followed by a peak and fall, then a hopeful bounce back to life. Most don’t realize yet where Detroit currently plots on that cycle. 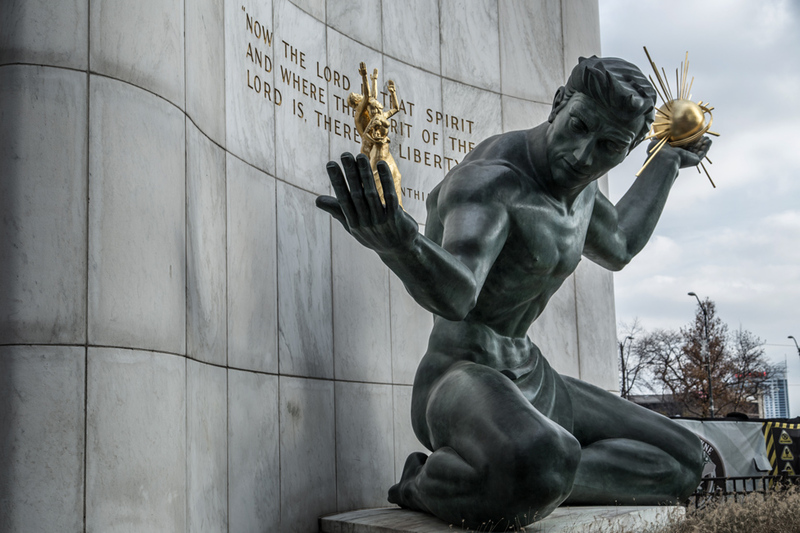 “The Spirit of Detroit” – this sculpture was the largest cast bronze statue since the Renaissance when it was installed in 1955. 1. Just down from where we stood was the corner of Michigan and Woodward. In the city’s heydays, the intersection was anchored by large department stores and held the title of busiest street-crossing in the world. 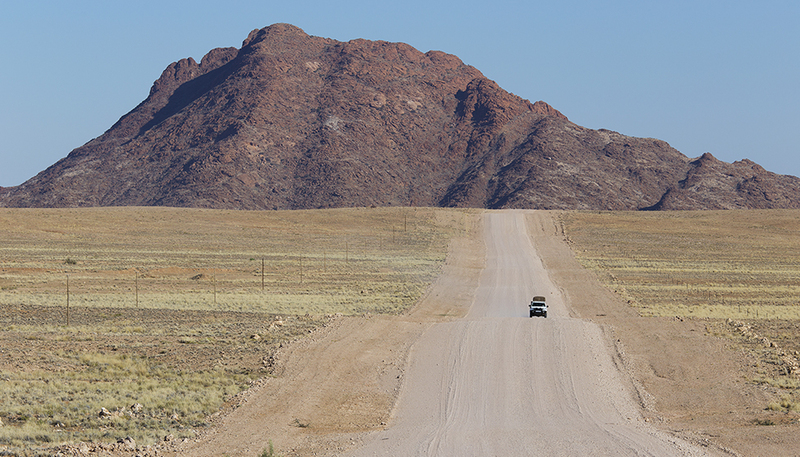 It was actually the site of the world’s first traffic light. 2. And just across the street, an empty lot that used to be the J.L Hudson Department store. It holds the world record as the tallest building and steel structure to ever be imploded. Around us, the streets were nearly empty. Campus Martius, hailed as “Detroit’s Gathering Place”, was the most lively spot, but with only a handful of skaters enjoying its new outdoor rink. We encountered a few others as they entered the historic Grand Trunk Pub further south. A small line-up of cars for the bridge to Windsor amassed at the waterfront, and I couldn’t help but think that to them we must have looked like an odd mass of people in an otherwise lonely place. This was normal, Calvin told us, but it was also clear that these empty streets won’t be empty for long. Large corporations are investing in Detroit’s rebirth: buying up empty buildings and refurbishing them, moving their offices in and offering incentives to their employees to live downtown. Of those living quarters that are habitable, 98% of them are full, some buildings even have a wait list. 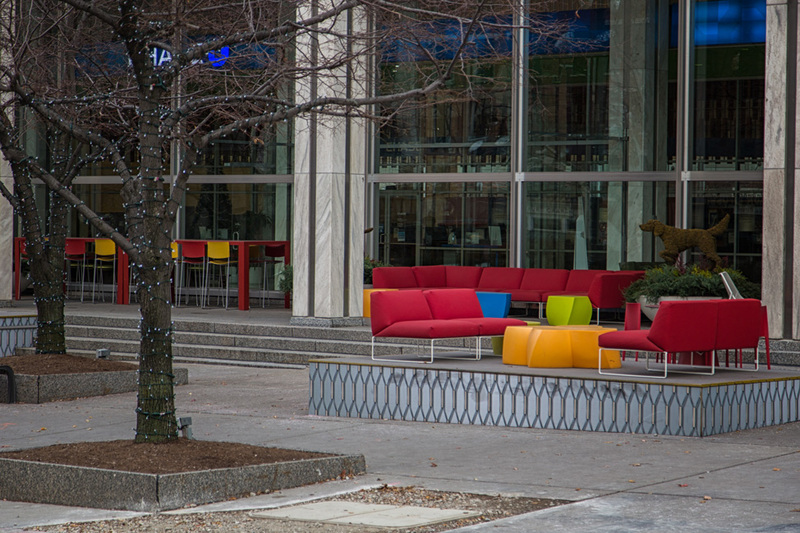 Outdoor lounging spaces are also popping up regularly. 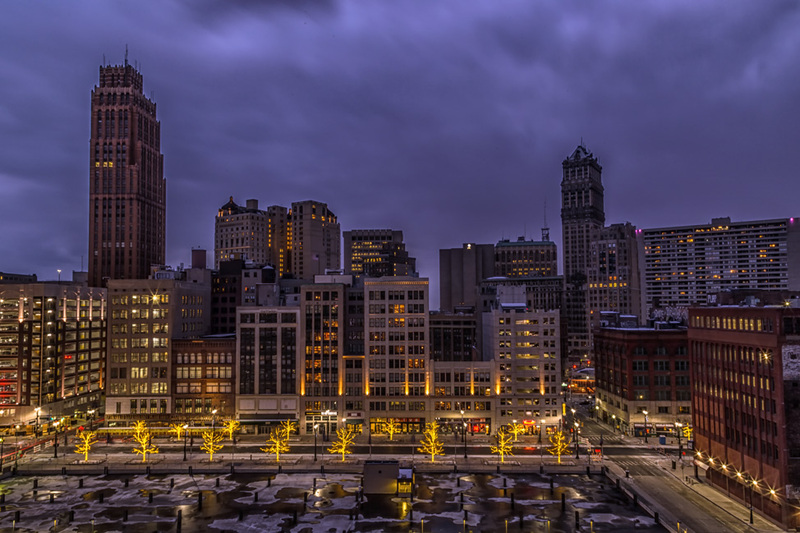 One of the major investors and a Detroiter by birth, Dan Gilbert of Quicken Loans, wants to encourage new occupants to be outside – to enjoy their environment and build a strong community. I couldn’t help but think that we must have looked like an odd mass of people in an otherwise lonely place. Near Capital Park, Calvin lamented that two years ago it wouldn’t have been safe to walk through it at night, but now, he can’t even afford to live there. One side has been totally refurbished with high end apartments, the other is still rundown but work will soon begin. 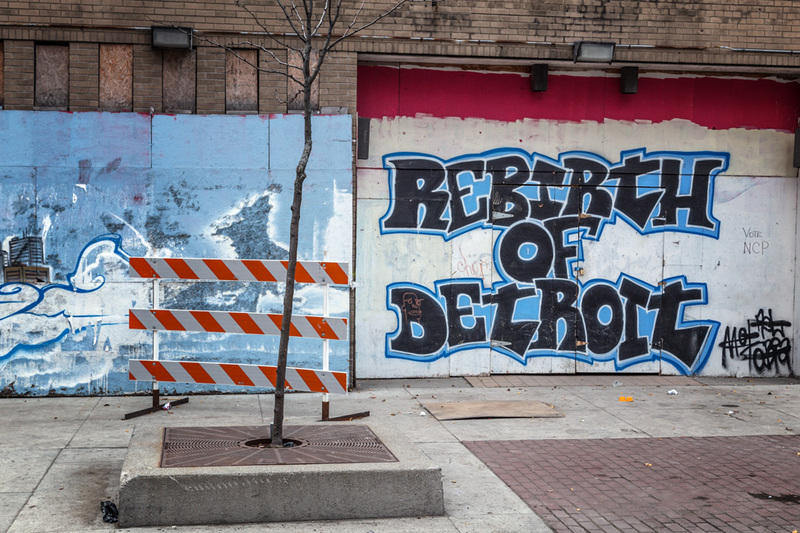 Detroit may still have a significant way to go, but much is planned. More modernized apartments, a new home for the Detroit Red Wings has already broken ground, a forty block retail district will emerge around it. We met two girls who identified themselves as Detroit residents early on in our tour. Curious as to what they were doing being guided through their own city, I asked. They shared their goal of wanting to open a gourmet hot dog cart the following summer, and so were striving to get more intimate with their surroundings. They were so excited about their ideas (a poutine hot dog – yes please!) and were like so many other Detroiters that we met – a little apprehensive at first but gushing with pride for their city when pressed. Detroit won us over, in part thanks to their enthusiasm. It clearly is one of those places we are thrilled to know now – like an intriguing indie rock-star on the rise – if only to say we-knew-it-back-when. To return in a couple of years (or even next summer for a poutine hot dog) will mean seeing a city that will look strikingly different, and will likely even include having to dodge growing crowds of people. If we had waited any longer to come, we would have missed this shining opportunity to see it at its birth. The food scene is bursting. New and trendy restaurants open every day, and we were nearly paralyzed with choice from where we stayed in Midtown. Trying a “Coney Dog” is a right of passage and a taste-off at the two most famous locations – American and Lafeyette – is a fun experiment. (Although, as our guide Calvin said: “if you like the Lafayette Coney best, you are wrong.”) The city is also home to the largest Middle Eastern population in America with a good number of representative eateries, as well as a strong Polish community (and you know how I feel about pierogi). 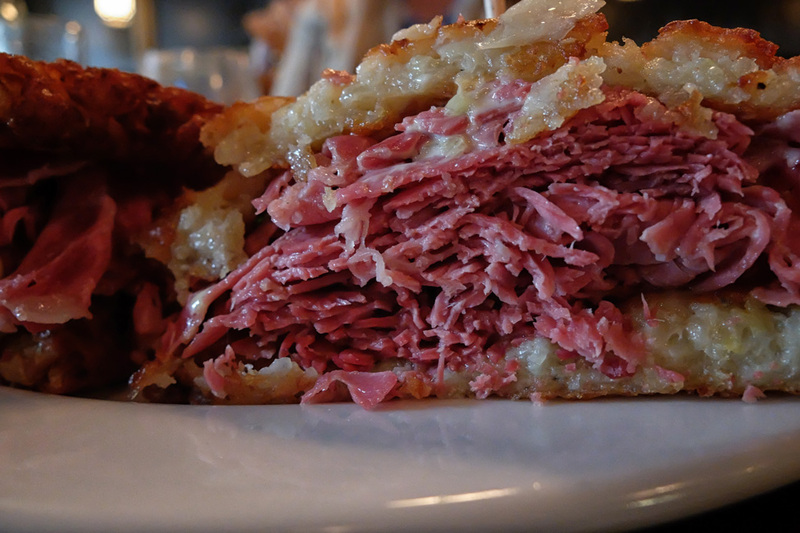 The most delicious thing we ate – a corned beef sandwich. Forget the bread – those are potato pancakes holding it all together. Devoured at Maccabees in Midtown. 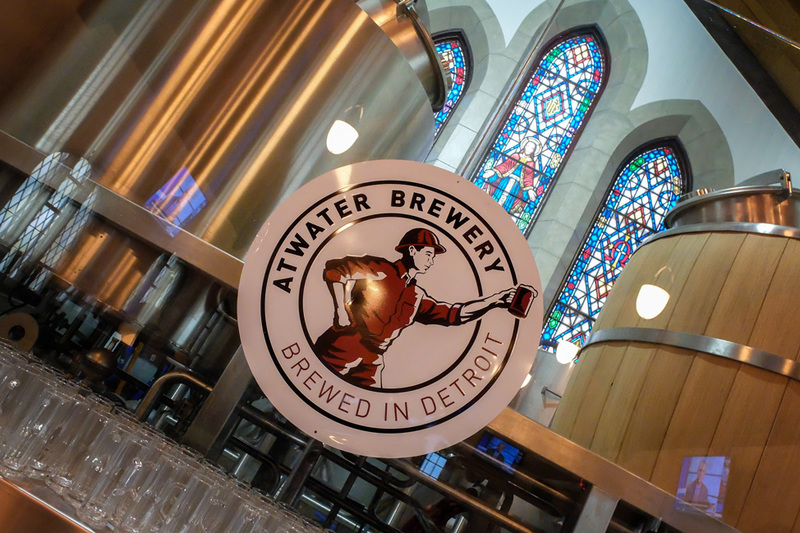 And to wash down your food, take in a visit to the Atwater Brewery in Grosse Pointe. This former church-turned-pub German-inspired and uses former pews for bench seating. Amen! There is so much of it – some documented and easy to find, some you will just be pleasantly surprised to happen upon. 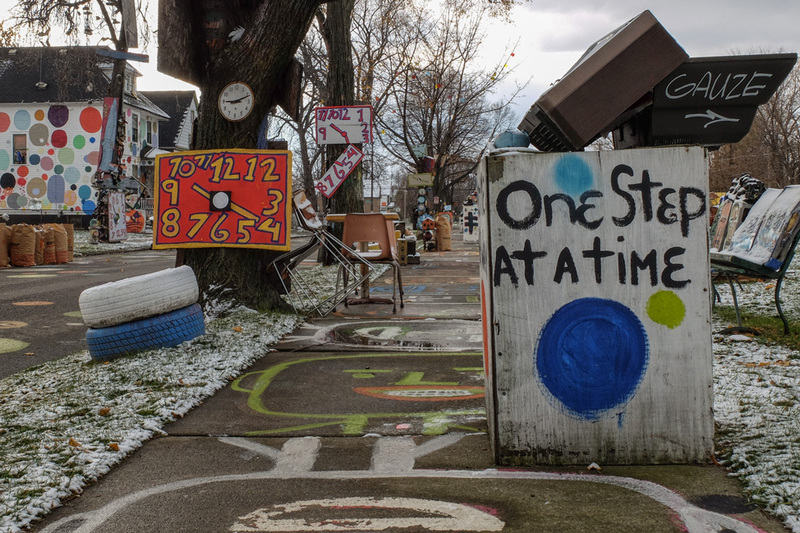 Most notably there is the controversial Heidelberg Project, a city block converted to an open art exhibit, with a similar project by another artist opened just across the street. Other exhibits we visited include the Lincoln Street Art Park (probably more appealing in summer), and the very cool Z-Lot, a downtown parking lot with each floor featuring popular artists brought in from all over the globe. View from the top of the Z Lot to more street art. …and you likely can’t go wrong. There’s the impressive Detroit Institute of Arts, the Henry Ford Museum, and the Charles H. Wright Museum of African American History, which are all reported to be excellent. 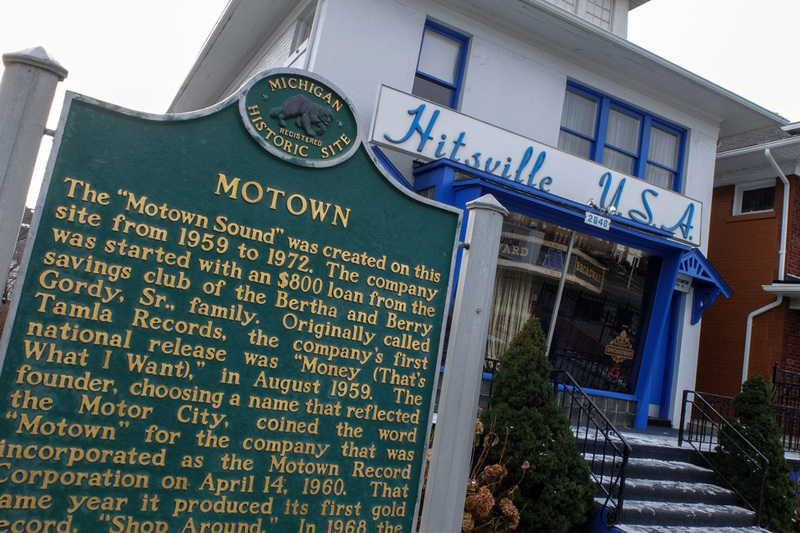 We only had time for one and so chose the Motown Historical Museum and were SO GLAD that we did. We got to sing “My Girl”! In a real Motown studio! 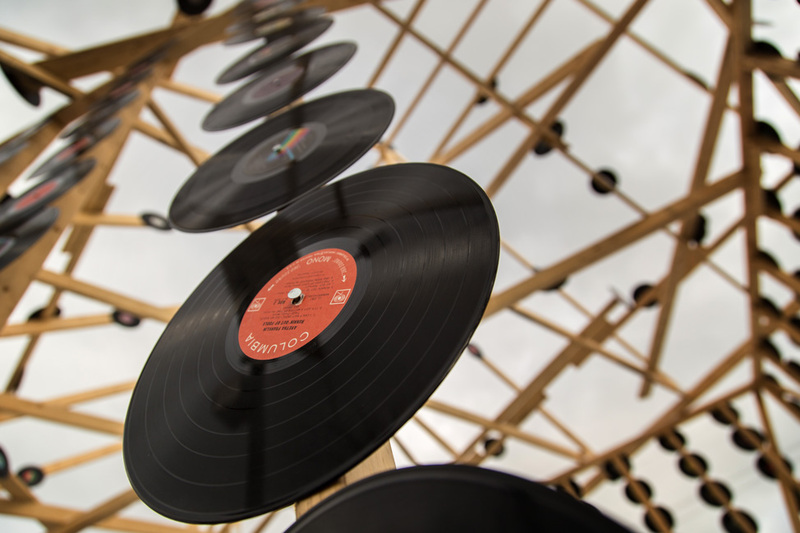 The Motown musical movement is an incredible piece of Detroit’s history – after leaving we professed that we had just checked off a bucket-list item that we never even knew existed before. Their free walking tour was as good as any we’ve ever taken, and a great initiative that we were happy to donate a generous tip to. The energy of that place alone is worth a stop in, to get a glimpse of the authentic “Detroit Do-er” spirit. The Inn on Ferry Street is a collection of Victorian mansions and carriage houses renovated into 40 exquisite guest rooms. It was charming and cozy, the breakfast spread was impressive, and the staff were all sincerely warm and welcoming. It’s close to many attractions, but also includes a free shuttle service within five miles of the Inn.Many thanks to Visit Detroit for their assistance during our visit. As always, all opinions are our own. Pushing past my fears was never so aptly rewarded. Appreciate the enthusiasm, but to say you “knew it back when” is incorrect.”Back when” was years ago…the 70’s, 80’s, and 90’s, when the rest of the nation pointed and laughed at the city.”Back when” was when we watched all the places that are crumbled today die a long slow death. Those beautiful buildings that suddenly everyone loves used to be alive “back when”. People actually travel here to take pictures of the carcasses of the ruins, but will never grasp the sadness of watching them die. Liz, I cannot disagree with you one bit, and please believe that my intention was not to make light of the history of the city. I can not for one minute imagine what it would be like to see such a beautiful city crumble as it has. But “back when” is relative, and by using that phrase I only meant to emphasize the positive energy we feel here now, and to share how excited we are to see what it becomes. Thank you for your reply Dalene, in no way did I think you were making light of the city, and I apologize for my rant. Of course I want the city to flourish, but I fear that it will lose its uniqueness in the process. 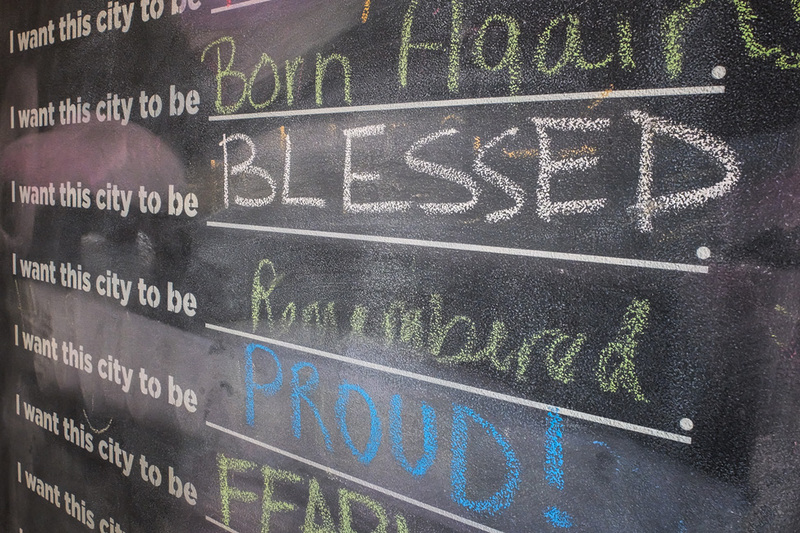 Many original Detroiters have left in order to find jobs… and in turn those with no history of the city are moving in. I fear the city will change and lose it’s identity, and all that was lost will no longer matter. My old stomping grounds! Well, sort of. I was born in Windsor, just across the water. But I remember the glory days of the Motor City when I was a kid. Times have certainly changed. My first job out of college was for a women’s specialty store chain in Detroit. Worked on the infamous 8 Mile Road, and then at their headquarters on Woodward Ave. Detroit’s decline was in full swing then; the last ditch was the Renaissance Center development on the river. I mourn the loss of the J. L. Hudson building. Such a grande dame of flagships. I remember lunching at its tea room on a very special occasion as a child with my great aunt. Could go on and on, Detroit. You’re right, there’s no vibe like the Motor City. Indomitable and poised for a comeback with respect. Lovely Betsy! Thanks for sharing your perspective! It’s so awesome to see cities bounce back. I’ve seen it slowly happen in Youngstown (which, years ago, had a reputation even worse than Detroit! ), and Cleveland is going through a similar rebirth (though is perhaps a little further along). 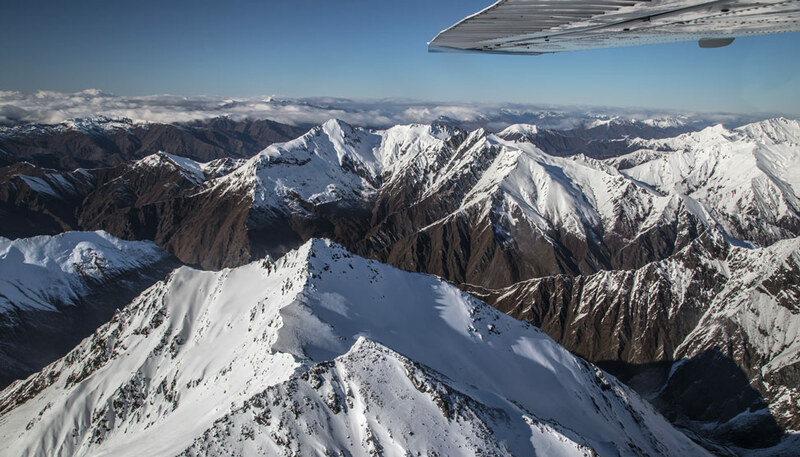 Amanda recently posted..Amanda’s 2014 Holiday Gift Guide for Travelers – PLUS a Giveaway! 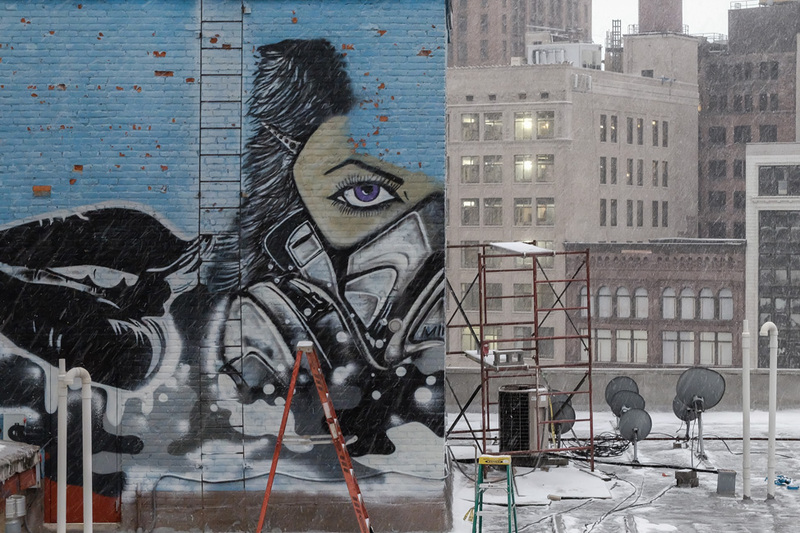 What was so cool about the street art is that we naively felt like it was all undiscovered. Which is fun, compared to some cities like Berlin where it is ALL ABOUT the street art and everybody knows it. Loved it! I haven’t been to Detroit for several years, but I’m fascinated by all the stories I hear about what’s happening there now. It’s had such a sad story, I would love to see something beautiful develop out of it. Like that amazing street art! I love the quote you first see and the street art! An interesting post for sure thinking about the city’s past and how it is today. Thanks for sharing! I live very close to downtown, about 15 minutes, and I love the city a ton. It’s a great place to go hang out, and not just in the central area. Lots of districts for food and cultures. 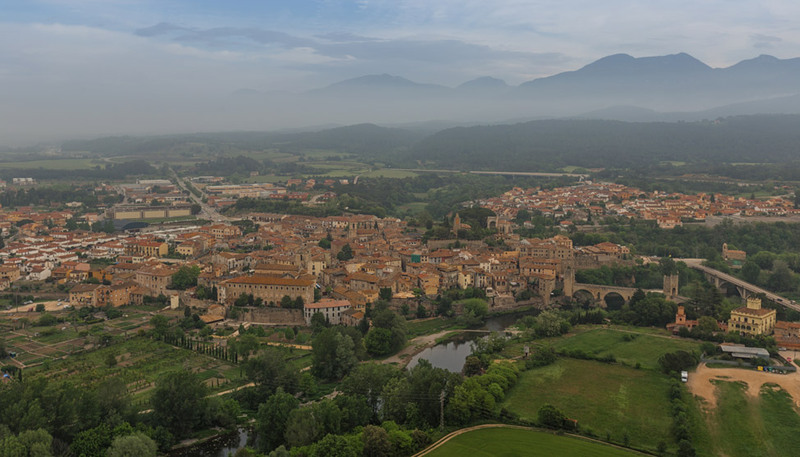 An awesome city for teens in that with its low cost of living and since teens obviously don’t make a ton of money, it’s a great destination for teens to go. It’s quite safe downtown, never feel unsafe. Lots of cool buildings and historical renovations are running rampet. One big downside is that we don’t have lots of family locations like amusement parks or cool resorts. We are definitely a city for people 18+. We also are a massive brewery city for you brew heads. Thank you both for positively representing Detroit on your blog. I am a bit of a latecomer to your site, having just discovered you two. Detroit is off the beaten path and has had so much bad press over the past several years, but really has so much to offer, including the Grand Trunk Pub. I am glad you enjoyed yourselves!! Let me know the next time you make it to town and I will happily show you more of the city of my birth.